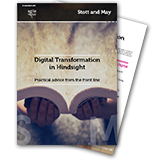 Wouldn't it be great if you could get the benefit of other people's hindsight when embarking on a digital transformation project? Well now you can. This advisory guide provides consolidated insight from our Agile Valley community comprising of over 100 technologists ranging from CIO's to Scrum Masters.